Heat oil in a pan, roast red chillies, channa dhal, cumin seeds, pepper corn and coriander seeds until they become slightly brown. Add onion and garlic and saute until onions become translucent. Add tomato and saute until they are tender. Turn off heat. Cool the above roasted ingredients and grind them. Heat oil in a pan, add mustard seeds. Once the mustard seeds splutter, add red chilly and curry leaves. Now add onions , saute till the onions become translucent. Add tomatoes and saute until tomatoes are soft. Now add the grounded paste and saute well. Add turmeric powder, chilli powder, sambar powder and mix well. Add half cup water and stir, add salt and allow to boil for 10 minutes. Add tamarind juice and mix well, allow the gravy to boil until the oil separates. 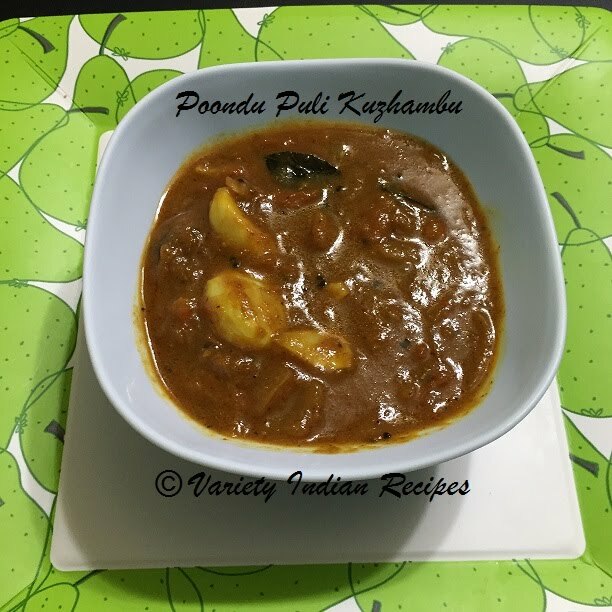 Spicy tangy poondu puli kuzhambu is ready.